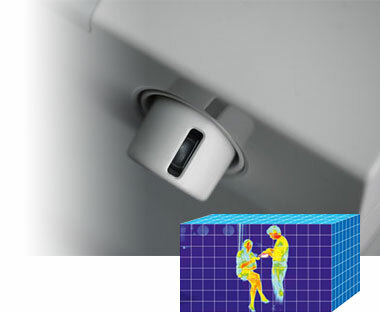 Exclusive to the Deluxe FH Series, the 3D “i-See” Sensor continuously analyses the temperature profile of a room to detect hot and cold spots. This intelligent 8-element sensor scans the entire room and divides it into 752 three-dimensional zones, measuring the temperature in each to detect the exact position of its occupants based on their heat signatures. The perfect amount of heating or cooling can then be customised based on preference. The 3D “i-see” sensor also acts as an intuitive occupancy sensor, able to detect when you leave the room. By then automatically switching into energy-saving mode the Deluxe FH Series raises or lowers the set temperature by 2°C as required, leading to potential energy savings of up to 10%. 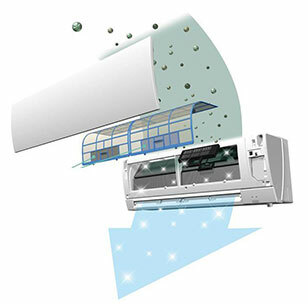 The unique dual split vane design allows airflow to be customised to suit different areas of the room, by independently directing air upwards, downwards or to the side. This flexibility can also prevent air from striking obstacles, or direct air to areas that require additional heating or cooling. 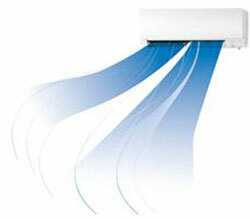 Dual split vane airflow is ideal for multi-level hallways in homes. Dual split vane design also means individual personal preferences can now more easily be accommodated. You prefer to feel the heat directly but your partner does not? Simple! A breakthrough in comfort, the dual split vane design allows direct and indirect air flow modes to be customised to suit both occupants in the room at the same time! If you thought all air conditioners feel drafty in cooling mode – think again! By automatically modulating fan speed and direction our unique Natural Airflow function recreates a light and gentle airflow that feels as natural as possible. and direction. All models in the Deluxe FH Series have been awarded the coveted Energy Star®mark, the highest energy efficiency award in its category. 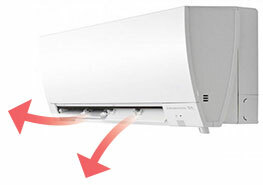 It also features Econo Cool - an energy saving function for cooling in summer. Many electrical appliances still consume power while left in standby, having a real effect on your power bill. The new Deluxe FH Series, incorporating cutting edge power reduction technology, boasts 1W standby power, a reduction of around 90% on previous standby power consumption. Mitsubishi Electric are still the only heat pump available guaranteed to produce its fully rated heating capacity right down to -15 degrees. Combining the best low temperature performance heat pump with rapid heating ensures you receive warmth when you need it most.